Pentagon's 2019 financial year budget requested equipment, weapons for up to 65,000 U.S.-partnered forces in Syria, including the Syrian Democratic Forces (SDF), predominantly led by the PKK-affiliated People's Protection Units (YPG). According to the budget bill that was signed by President Donald Trump and submitted to the U.S. Congress for approval back in February, Pentagon requested $300 million to arm and equip its partners in Syria for the fight against Daesh. $250 million was also requested for building "border security" in Syria. The full report -- FY 2019 Overseas Contingency Operations (OCO) Request Counter-ISIS (Daesh) Train and Equip Fund (CTEF) -- obtained by Anadolu Agency on Monday shows the U.S. administration's willingness to arm and equip 30,000 for conducting ongoing combat missions against Daesh in the Middle Euphrates River Valley, and 35,000 "Internal Security Forces" in liberated areas across the country. "To accomplish U.S. military objectives, partner force generation in Syria will be comprised of local forces that are demographically representative, appropriately vetted, trained, and equipped to ensure a safe and secure environment and capable of countering ISIS [Daesh]," it said in the budget proposal. According to the proposal, the Pentagon plans to allocate $162.6 million of the $300 million on weapons, equipment, and vehicles, $8 million on base life support which provides basic humanitarian needs, $28 million on transportation and staging costs, and $101.5 million for operational sustainment. Among the weapons being planned to be sent include 25,000 AK-47 automatic rifles, 1,500 light machine guns, 500 heavy machine guns, 400 RPG-7 rocket launchers, 95 sniper rifles, 20 60mm mortars and 60 120mm mortars. Along with its total of $47 million cost, Pentagon also requested additional $24 million for ammunition of these weapons. The budget bill was presented to Trump before he said he would "ideally" start to bring home U.S. troops from Syria within a six-month period, and before Turkey and the U.S. held working group meetings to discuss a number of issues, including the stabilization of Manbij, Syria and preventing any undesirable clashes. 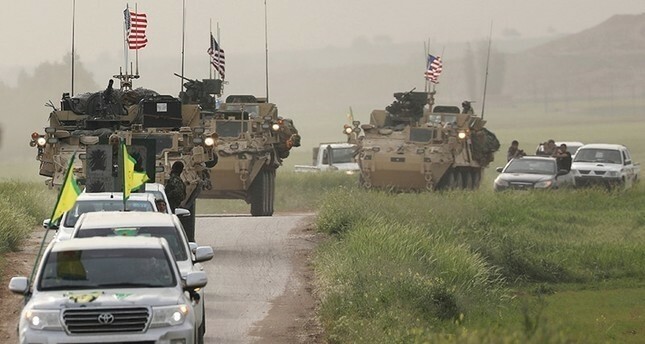 The U.S.' Syria policy, especially its military support for the Syrian Democratic Forces (SDF), which is dominated by YPG terrorists, has been a cause of tension between Ankara and Washington. The U.S. relies on the YPG to fight against Daesh on the ground, while Ankara argues that one terrorist group cannot be used to fight another.